Transcription Outsourcing, LLC is the leading full-service transcription company in the US. If you can record it they can transcribe it. Their services include medical transcription, legal transcription, law enforcement transcription, financial transcription, academic transcription, podcast transcription, and more. However, I wanted to chat with CEO and founder, Ben Walker his experiences working in the freelancer economy and what changes he has seen in that time. I’m curious about the shift from doing everything ourselves to the need to save time and the rise of the DIFM (Do It For Me) movement. We also discuss how transcription is increasingly being used to repurpose content whether that be a podcast or a video that can then become a blog post and then a series of blog posts can become a book. BEN: Neil, thanks for having me. 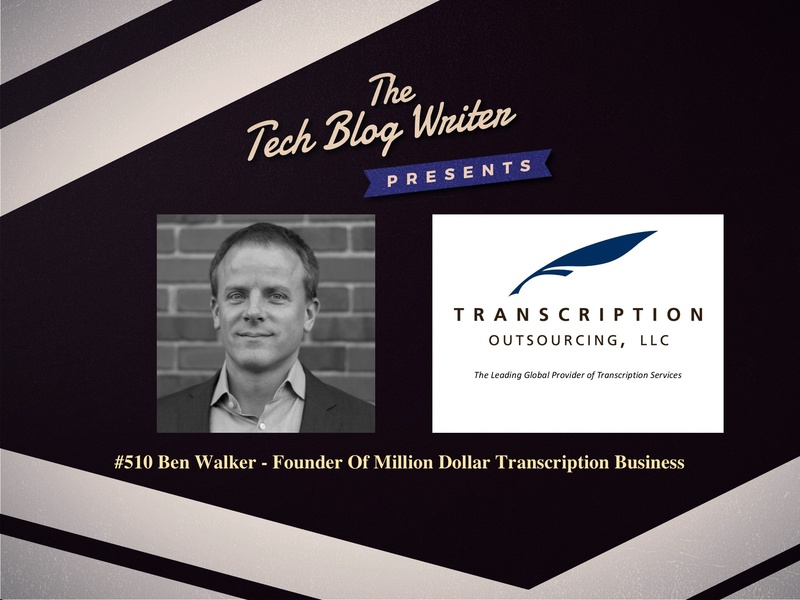 My name is Ben Walker and I am the CEO and founder of Transcription Outsourcing, LLC, in Denver, Colorado. We provide transcription services for the legal industry, the medical industry, law enforcement, academic, financial and general business. NEIL: So just for transparency, we met in February at the No Longer Virtual event and we got talking about transcription and there just seems to be a real art about it. I mean, do you think that transcribing audio is so much harder than most people think, and they’ve got no idea about the art that goes into that and the hard work as well. BEN: Oh yeah, it’s much more difficult than people can comprehend unless they’ve actually done it and they’ve sat there with headphones and attempted to transcribe, you know, an eight-person focus group. It’s difficult keeping track of who’s who and everything that’s said because our transcripts have to be perfect ’cause our clients want perfect transcripts so we have to give them perfect transcripts. And that’s where people get hung up, is leaving out the little things that could actually change the context so our client will come back to us and say you missed this. You know, and then we have to fix it and give it to them for free if we don’t do it right. So just being a fast typer isn’t good enough; you’ve gotta have a really good ear and pay very good attention to detail. NEIL: Now I do imagine that when you first started out your business, your customers would’ve been in traditional industries such as legal, law enforcement, business, medical, etcetera. I’m curious, has that changed at all with the arrival of the freelancer economy and, in a world where we’ve all become content creators now, is that bootstrapping, do-it-yourself, thing now being replaced by do-it-for-me movement? BEN: It is, and this is a good question. We still have the traditional industries, hospitals, and doctors’ offices; it’s the one-off projects that we don’t get as much of ’cause they do have access to freelancer.com and Upwork, and FreeeUp is another good freelancer website that, if you’ve got time and you’re savvy, you can go find somebody. The weird part is if you’re using the U.S.-based or even a U.K.-based or an Australian-based, you’re paying the same price that you would pay me. NEIL: So how are advances in technology helping your business to evolve? And as a result, are you getting more requests from solo printers that are wanting to transcribe their audio content into a book, blog posts, etc? Do you get a lot of work like that? BEN: Yes, we’re starting to get more of it as we get the word out. And we do actual marketing through people like John White who do the outreach for us to let people know that this is even an option for them. Yeah, it’s more about getting the word out that we’re here and that we do that, and we can help them turn podcasts, for example, into blog articles. And we’ve worked with authors too all over the world; they do interviews, then we transcribe it, and they tell us that they have us transcribe as opposed to taking notes because they want to be fully into the interview instead of writing at the same time. NEIL: Absolutely. I think something a lot of people don’t realize, that one piece of content, whether that be a podcast or a video, can then become a blog post and then a series of blog posts can become a book. There’s so much value, isn’t there, in transcribing a lot of things. BEN: It’s tremendous value. Now people are turning things like this into courses. And the people that do traditional courses where they have a classroom, they’ll record those and turn it into a course and no one would have thought of that five years ago. NEIL: Now you’ve experienced the ups and downs of owning a business but what have been your biggest challenges? I mean have you overcome many big mistakes over the years and if you did, how did you overcome them? BEN: Oh man, I’ve made more mistakes than I can possibly keep track of. I can probably write a book on how not to do it. It’s learning from them and not repeating the mistake twice. That’s how you get through these, ’cause everyone’s gonna make mistakes and make the wrong decision. Even though you may have thought about it all weekend, you still make the wrong decision. It’s learning from it and not doing it again. The biggest mistakes I’ve made over the years was probably hiring the wrong people that weren’t the right fit, ’cause then that has an effect on the clients; that has an effect on getting referrals; that has an effect on our reviews online. It just reverberates down the line and then it’s bad. NEIL: I think a lot of people underestimate the cost of having a bad hire, don’t they? BEN: Yes, it can be tremendously devastating for a business if you have the wrong person in the wrong seat. And it’s not that it’s their fault, I would put the blame on myself for not recognizing they weren’t a good fit: I didn’t ask the right questions during the interview or when we on-boarded them, we didn’t train them properly. So it’s my fault; it’s not theirs. NEIL: So if I could take you back in time to when you very first started, and you were probably a very different person back then and a little bit wet behind the ears, so here you are now: what are the top things that you think you wish someone would have told you back then, when you very first started your business, that you think could’ve saved you so many pain and headaches? BEN: Oh, this is gonna sound strange, but this is an easy one for me: There are two things and the number one thing is getting a coach; having a business coach has been a tremendous help. His name’s Bill Treadwell, he is phenomenally good at his job and has helped me a lot. Having the opportunity to bounce things off another person who’s been there, done that, has been very helpful for me and I think would help anyone who owns a business. The second one is public relations; I wish I’d known how important public relations were in the whole sales and marketing world. I didn’t realize how important that piece of it was. I thought it would just be traditional – you’re online, you go to conferences, you meet people, they do business with you – but that’s not necessarily how it works. NEIL: So back then, did you just do everything yourself? BEN: Yes. Oh, I did way too many things and I did them all not as well as I could have because I was spread too thin. NEIL: Now I could be wrong, but I would imagine transcribing dry legal content could be quite difficult and also hard to actually stay motivated. So what advice would you also give to other CEOs or founders to actually help motivate their employees and get them to thrive? BEN: Well, you’re right, transcribing legal content is extremely boring, especially when it’s depositions that have to do with, let’s say, intellectual property or patent law, you know, the boring stuff – environmental law. That is really boring. It’s the people; you have to get the right people that like doing that ’cause we actually have some transcriptionists that love – they love these really in-depth intellectual property-type cases that no one else can – I mean people are willing to do anything else but that. It’s finding the right people. I wouldn’t really say it has too much to do with me as my people in my office that work with our transcriptionists, that figure out who’s good at what and who likes what. NEIL: What kind of person is a transcriptionist? I don’t want you to offend anybody out there, but does it take a certain kind of person, a certain kind of aptitude, to actually embrace that and actually enjoy doing it? BEN: Yes. ‘Cause our people work from home. So they’re generally at home alone in their office, you know, doing their thing with headphones on and a foot pedal and a computer and a couple, you know, monitors in front of them. It’s people who don’t mind being by themselves for extended periods of time and having little personal contact with, you know, the office ’cause sometimes we don’t talk to them for a month, two months, three months; all we do is get emails back and forth and chat messages. Yeah, it’s not for an extrovert, that’s for sure. NEIL: But on the flip side of that, they get the flexibility to work from home and by their own rules and at their own times, etc? BEN: Oh yeah, they can work at 4 in the afternoon or 4 in the morning; it’s totally up to them as long as they get, you know, the work is done and on time. NEIL: So on a personal level, do you have, like, a personal, life lesson quote or something that motivates you or something that you consider to be like the backbone or the ethos of what you stand for? BEN: Richard Branson said something to the effect of, “Just bugger on and do it.” Yeah, just get started; stop talking and start doing. You can overanalyze and think and maybe I shouldn’t do this, or maybe I shouldn’t – you just gotta do it. I don’t like doing accounting work but I just started doing it. Once you start, you keep going and you finish it and it’s over. Yeah. NEIL: There are so many people now that wanna talk about things again and again and again, have meetings to discuss meetings and nothing gets done, does it, that way. NEIL: Absolutely. Now, looking into the future, I think all businesses now have got to be prepared to evolve or pivot with changes in technology: so does the future possibilities of artificial intelligence concern you at all, or is that just something that you would actively explore with an open mind, if and when that was to come to fruition? BEN: Yeah, we would obviously have to explore it with an open mind. Voice recognition has been taking over the medical transcription industry; that’s actually why we got into legal transcription and law enforcement transcription and academic transcription, was because of technology and voice recognition. It’s really good at recognizing one person’s voice; when it comes to two and three and four and eight people, that’s where there are challenges in artificial intelligence. We will see how it fits into our workflow and if we can utilize it. At the present time, I would imagine it would probably need human editing to make sure it’s 100% accurate. Just like the medical transcription industry, I know the large companies have between 20 and 30-thousand employees in India, editing the voice recognition to make sure it’s accurate and that’s for a single person. I don’t know, it could happen. I don’t know if it will. They all say they’re working on it and they have beta versions, but they’re not being released to the public so I’ve never seen the output yet. NEIL: Yeah, I’ve read a lot of things about this area and I think a single transcription, I think, will probably work much better but if you’ve got a room full of people, I think it’s very hard for a machine to differentiate between each individual speaker. I think that’s where it particularly struggles. BEN: Yeah, and then accents. It may not recognize your accent or mine or, you know, the next guy. NEIL: Well a big thank you for coming on today but, before I do let you go, if anyone is listening or thinking about how you could help them repurpose their content, whether it is a video or a podcast that they could transcribe into blog posts which then end up as a book, there’s so many different aspects that you could help them with there. They’ll probably have a lot of questions, such as what countries do you serve, how easy is it to get up and running, so can you remind them of where they can find you online and also contact your team if they have any questions at all? BEN: Yeah, you can find us at transcriptionoutsourcing.net on the web, at Data Transcriber and @benjaminkwalker on Twitter. We’re also on LinkedIn quite a bit, Ben Walker on LinkedIn and Transcription Outsourcing, LLC on LinkedIn. We have clients in Australia right now and the US. We’ve worked with people in the UK. It’s mainly English-speaking countries because we don’t really provide translation services, so English-speaking countries: Canada, US, UK, Australia, South Africa. You can always call us; we’re open 7 to 5 Mountain Standard Time in the US and someone will answer the phone. We don’t like getting voicemails so we answer the phone. NEIL: Chatting with Ben really opened my eyes to how individuals or small businesses or even multi-national corporations are all using trained transcriptionists for a variety of reasons. I think it’s great to hear, as well, how Ben’s team used dedicated account managers so they can actually provide personalized attention or to ensure that people get the transcription service that they actually want, because like anything in life, there really is no one size fits all. But once again, I think it’s also funny how the universe points you in the right direction. I mean I was looking for a transcription service and then I bumped into one on the other side of the Atlantic. Moments like that really do get me thinking but then it just completely melts my brain. So a big thank you to Ben for coming on today and also for everyone that’s tuned in. And if you’ve had an experience, whether it be good or bad, with any transcription service, I wanna hear from you.